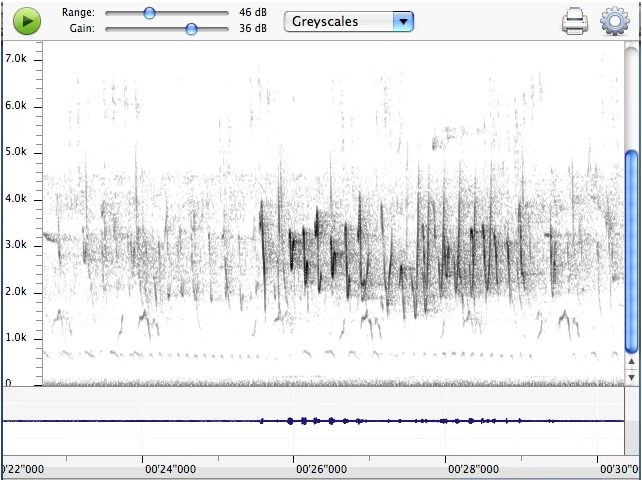 Fixed sonograms as jpg images are very useful for birdsong papers, but scrolling sonograms made as movies go one step further and show the sound and the sonogram together. This scrolling mono sonogram was made using Amadeus Pro and iShowU screen capture on an iMac (needs Quicktime to view). Yellow-faced Honeyeaters are the main callers in this dawn chorus extract, recorded January 2012, rural NSW. Click on this link to see the movie (2 mb). The next scrolling sonogram is in stereo, made using iZotope RX with iShowU screen capture, saved in Quicktime format. Click on this link to see the movie (3.6 mb). This page last updated 2 June 2017.